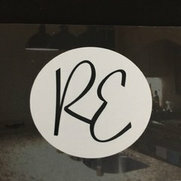 Since 1983 Remodeling Experts has become a Chicago mainstay on the Gold Coast, Lincoln Park, and other lake front communities completing countless condominium and home remodeling projects using the finest materials and competitive pricing. Owner Jim Heaney is a Chicago Lakeview resident, and has renovated his 1896 farmhouse, which showcases a traditional kitchen, bathrooms, siding, windows, deck and porches. Jim listened to my ideas, made suggestions and executed my decisions regarding the remodeling of my bathroom in a medium size condo building. It turned out great with minimal disruption to my home When I spotted a few things I wanted touched up/done after the work was completed, he had them taken care of quickly. After a terrible experience with a different contractor remodeling my other bathroom, Jim and his team were a welcomed relief. Jim took on more heavy lifting getting tiles and a shower door while I began a new job. My bathroom has been completed for a few months now and is holding up beautifully. 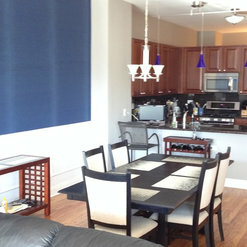 I live in a townhouse in the Lakeview, Chicago neighborhood and our family was looking to renovate our basement area. Jim had designed and constructed my neighbor’s basement so I contacted him. 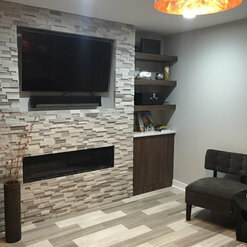 The challenge was to keep an exposed brick wall in the basement and incorporate an ultra thin gas ventless fireplace with a recessed space for a TV above the fireplace. My wife and I conveyed our overall design ideas and Jim created a floor plan which consisted of a recreation room, fireplace area, bathroom, bedroom/office, and utility room. Jim showed us examples of other bathrooms where he had incorporated white and black tiles, vanity and custom shower with glass doors. The custom tile in the bathroom was a great touch! Jim managed the construction process with his workers and we now have a beautiful new recreation room, exposed brick, television area and custom bathroom. Jim clearly communicated the timeline and costs, and we came in exactly on budget even with a few surprises we didn’t expect. Thanks Jim and Remodeling Experts Of Chicago for everything! I live in a newly purchase condominium at 474 N. Lake Shore Drive and I wanted to renovate my bathroom and install a kitchen tile backsplash. 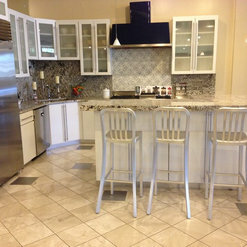 Jim was the contractor that did other work in the condo years before and was referred by the seller. We exchanged design and tile ideas on tile and Jim supplied the necessary insurance and licensing requirements to the building management company and scheduled the project. The project took three weeks and I now a beautiful bathroom and kitchen backsplash tile. Thanks Jim for a great experience. My husband and I live in the Lakeview neighborhood and were looking for someone to renovate our master bedroom. Jim facilitated the design process by presenting steam shower ideas, cabinets, tiles, plumbing, fixtures, and pocket door installation. We had a wonderful experience with the process and would definitely use Jim again. Thank you Jim Heaney and Remodeling of Chicago for an incredible renovation experience. My husband and I live in a condominium in the West Loop, neighborhood in Chicago and we wanted to renovate our master bathroom. We have a neighbor in our building that recently renovated her bathroom and recommended Jim Heaney and Remodeling Experts Of Chicago. The scope of work included saving a white tub and travertine marble floor tile and matching travertine counter top. We had a stained plastic shower base, which we wanted, removed and replaced with a new custom shower base and shower wall tiles and tub surround tiles. We met with Jim and he suggested that we be daring and incorporate some color and movement to our new shower and tub surround tile. Jim also recommended replacing the recessed ceiling lights and exhaust fan with new LED lights and fan and changing the wall paint color. 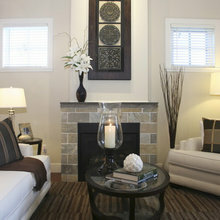 Jim presented a wall tile, which had a mixture of the travertine color and vertical gray. The construction process went great! Thanks Jim for a beautiful new bathroom. Remodeling Experts Of Chicago were great! My wife and I live in Lincoln Park and we decided to renovate (3) bathrooms in our townhouse last winter so that we could put our home up for sale this summer. We were hopeful to find a contractor who we could trust with our budget and also incorporate a small vacation during the construction. We contacted Remodeling Experts of Chicago and Jim Heaney through Facebook Jim conveyed his design concepts and we found him to be experienced and confident about the construction process. Jim designed our bathrooms and ordered bathroom fixtures, faucets and tiles and supervised his workers without errors during the construction phase. Our budget and finishing date were achieved as promised. Thanks Jim for a great experience! We live in a highrise in Edgewater and needed to remodel the master bath. Some of the demolition work had already been completed, and we had initially chosen a different contractor to complete the demo and rebuild our bathroom. Two days prior to the agreed upon start date, the contractor we had initially hired postponed our project indefinitely and left us scrambling to find a new contractor. Luckily, we found Jim Heaney. Jim and his team finished the demo which involved removing the original ceramic tile floor, a cast iron tub, and drywall. After demo, they reframed a wall, installed new ceramic and porcelain tile on the floor and walls, built a walk-in shower and installed a new toilet, vanity, and towel warmer. Jim was on-site daily to meet the workers, and he contacted me with any issues or concerns as they came up and provided daily progress reports. His team started and completed the job on schedule, kept the worksite neat, asked questions, followed instructions, and abided by our condo association's rules. The project was finished on budget and on schedule. 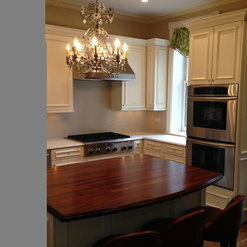 Everything looks great, and we would not hesitate to hire Jim again. 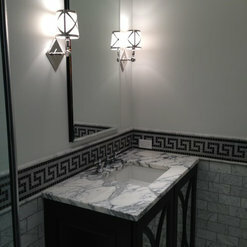 I live in a single family home in Ravenswood Manor and I needed to remodel my master bathroom. I wanted to remove my existing tub and replace it with a custom shower and remove an existing shower and replace it with a custom linen closet and medicine cabinet. 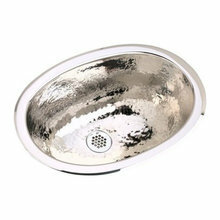 The project also consisted of new LED recessed lighting and extensive tile. 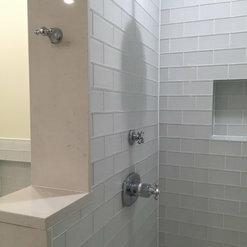 A local plumber referred Jim Heaney and Remodeling Experts Of Chicago to me and after researching Jim and his firm I decided to them for my bathroom renovation. Jim Heaney was helpful with the overall design, tile and fixture selections and also passed on his contractor discounts to me. Jim Heaney was trustworthy and we were able to go on a planned summer vacation while the bathroom was being remodeled. 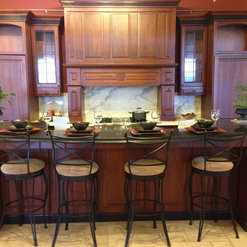 Jim’s attention to detail was great and I wouldn’t hesitate to hire Remodeling Experts Of Chicago for my next project. I live in a condo in the west loop and I wanted to re-do my master bathroom. I wanted to remove my existing tub and make a larger custom shower and remove an existing shower The project also consisted of new LED recessed lighting, exhaust fan, extensive tile work, vanity replacement, mirrors and sconces. 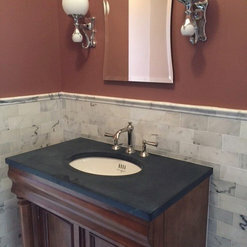 A friend referred Jim Heaney and Remodeling Experts Of Chicago to me and after researching Jim and his firm I decided to hire Jim for my bathroom renovation. Jim Heaney was helpful with the overall design, tile and fixture selections and also pass on his contractor discounts to me. Jim Heaney was trustworthy and we planned my bathroom renovation around a vacation I had planned to Australia. I left for Australia and when I returned two weeks later the plumbing was complete, new walls installed and the tile installation was underway. I was happy to see the progress and was pleased that I missed a major part of the renovation. Jim’s attention to detail was great and he made showroom visits with me, coordinated my selections and facilitated all aspects of the project. 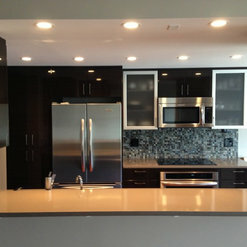 I wouldn’t hesitate to hire Remodeling Experts Of Chicago for my next project. My wife and I live in a condo in Lakeview and we wanted to turn our basement into a usable space consisting of a bedroom, bathroom and recreation room. We didn’t have an existing bathroom in the basement and so new floor drains for the toilet, sinks and shower had to be created. After researching options we selected Debra Weninger from Debra Weninger Design who recommended Jim Heaney and Remodeling Experts of Chicago. Debra and Jim worked together and we now have a fabulous bedroom, bathroom and recreation room that we will enjoy for years to come.